From the most powerful Jedi in the galaxy to genetically engineered clone soldiers, the Clone Wars offered warriors of every sort a chance for daring action and grave danger. As a Clone Army General, the powerful Jedi Master Yoda was a shrewd commander of men - including the young Jedi Anakin Skywalker - and a tough frontline fighter in many important battles. 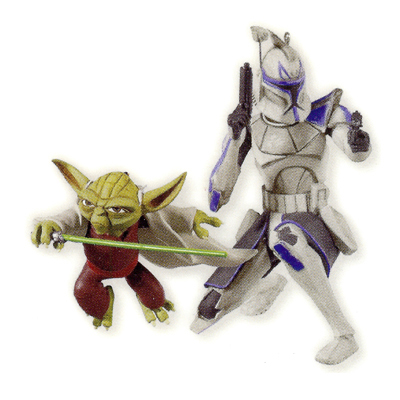 And while Yoda led, Clone Captain Rex served as Anakin's second-in-command - an aggressive combatant who freely dispensed strategic advise and shots from his blaster. In a long war that ultimately changed the future of an entire galaxy, these two bravely stood strong in defense of the faltering Republic.